the Jaycopter Corporation, made a 16-seat model for use at the New York World’s Fair of 1964-65. There, the Jaycopter hosted famous passengers including John F. Kennedy Jr. and Caroline Kennedy. Three eight-seat models were also produced, and were set up at midways throughout North America in Edmonton, Calgary, Vancouver and San Diego, California." It was called the "Baby Jay"
Last edited by KC; 25-10-2010 at 01:09 PM. Wow, thanks KC. That's a very serious blast from the past. I remember playing with the Jaycopter machine at the Edmonton International airport in the early 70's. I didn't know about its heritage at the time. There is one at the Aviation Museum. Building 14, Industrial Airport , Edmonton, Canada. The 16-passenger model would "fly to a ceiling of 90 fee and have a 125-foot diamatere circular flight path. It (was) powered by electric motors..."
Last edited by KC; 25-10-2010 at 01:50 PM. OMG I remember the little arcade JayCopter!!! That was sooo awesome! They were rare when I was a kid though. I gather that the original plan was to build the full scale models for civilian and military pilot training. 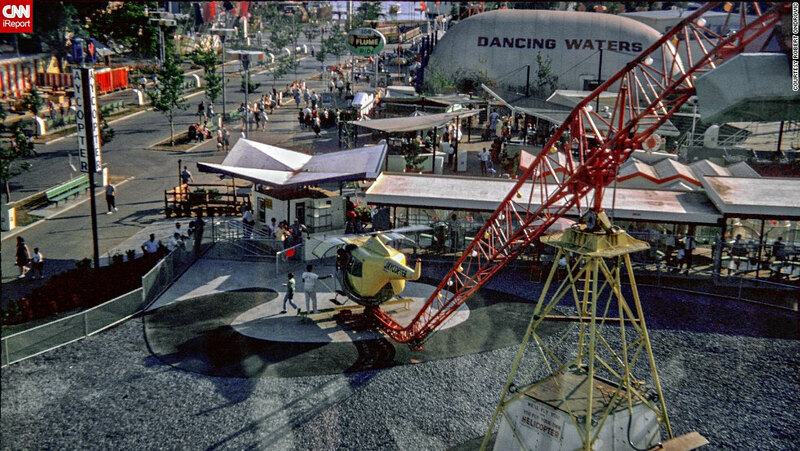 Amazing product / marketing line though: They offered everything from a great little toy version, to a World's Fair (entertainment) version to the training version itself. Total flashback! I remember playing that once at the Muni. I remember playing the toy version in the airport as well. It was a blast! Playing with the toy version is my earliest (and one of my only) personal memory of the Muni. The original Jaycopter is at the Reynolds Alberta Museum awaiting restoration. Similar to the worlds fair version but designed as a helicopter trainer for instructor and student...never caught on. The Arcade version as you know did and went around the world. (1) very early model (1) version from the late 60s, early 70s. Drop down and spend a quarter to relive your childhood. I worked for Pete Jacobs along about '67 or '68. Several of us, including one of his nephews were involved in building Baby Jays as well as running an 8 passenger Jaycopter as an amusement ride in Happy Valley near Calgary. Pete was a wonderful man to work for and it is a shame that his invention never received the recognition it deserved. We hope to change that for Pete Jacobs and others in time. If things can be worked out with the City of Edmonton for additional space on our current site or if we are forced to do something different we hope to gain enough room to be able to tell more of Edmonton's aviation stories and the Jaycopter is one. As well as the the lives of the mechanics, ground crews and flight engineers that kept things working day to day...could not have happened without them. We also need to create galleries for World War One and between the Wars, Agricultural aviation, Water bombing, Air Ambulance Services and expand existing. We are working on it but it takes time, space and people (yeah money too) and right now the single biggest problem is space. Working Jaycopter in an arena / entertainment district? Bedside a funicular platform at Rossdale? Or, built into the public space of the ECCA development? That's ironic because the ECCA idea was an afterthought! It is an interesting idea but a reproduction that would meet today's safety standards and be electrically powered would be hellishly expensive. By the way, in the Flickr picture that Randy L. posted, see the "blue block" on the opposite end of the 'crane' from the helicopter? That's the counterweight, and it moved in and out on the track that you see there. How that movement was synchronized to the throttle controls was the key to how the whole thing worked, to keep the powerful helicopter from wrenching and twisting the support structure into a heap of scrap metal. Competitors weren't able to figure it out or make it work right. But the Jaycopter people came up with the right equations. But the thing that did in Jaycopter before they could get into mass production, was the advent of computerized flight controls and advanced flight simulators. But the experts (that I found on the web) say that even the best of today's flight simulators still does not reproduce as accurately the sensation of helicopter flying the way that the Jaycopter did." Someday I hope to go through my dad's old photos, etc. and scan in some of the WWII/post-WWII Aircraft Repair information. I've already donated some stuff to the City Archives on their manufacturing of planes, boats, etc. plus an organizational chart, etc. Last edited by KC; 18-06-2015 at 01:28 PM.